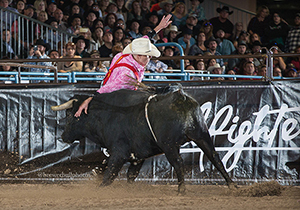 LAS VEGAS – Daryl Thiessen only thought he was done with freestyle bullfighting. Whether he was tired or had lost focus, the Elm Creek, Manitoba, man thought his time in the bullfight arena was over. He was ready to move on and focus on protecting cowboys during bull ridings and rodeos and remove himself from the competitive side of his life. Aaron Ferguson is a fellow Canadian bullfighter and is founder and CEO of Bullfighters Only. He understood Thiessen’s hesitance but reminded the young cowboy about the talent he possesses in his 6-foot-5-inch frame. He also reached into the inner core of who Daryl Thiessen is. Thiessen will be part of the Bullfighters Only Las Vegas Championship, set for Wednesday-Saturday at the Hard Rock Hotel & Casino. He advanced through the Pendleton Whisky Qualifier Round last week. “Fergie said, ‘You’re the most patriotic Canadian I’ve ever met; freestyle bullfighting needs a Canadian to be the man and build the sport in Canada,” Thiessen recalled. “Honestly I get goose bumps thinking about being the Canadian representative to that. Freestyle bullfighting is truly a man-vs.-beast sport with danger and excitement at every twist and turn. By reaching for glory, the men will step closely to peril. It’s a tight-rope walk for every man who does it, but that’s part of the draw. It’s exciting to be inches away from an athletic bull that is hell bent on running them down. Thiessen has lived it and has loved it. Now he hopes to prove why he expects to be one of the best. The BFO Las Vegas Championship is set for Dec. 7-10 at the Hard Rock Hotel & Casino. Tickets are on sale now at HardRockHotel.com and AXS.com.